BFD RECRUIT NY OPEN HOUSE TOURS ON SUNDAY, APRIL 28! Want to find out how you can help serve the community where you live? 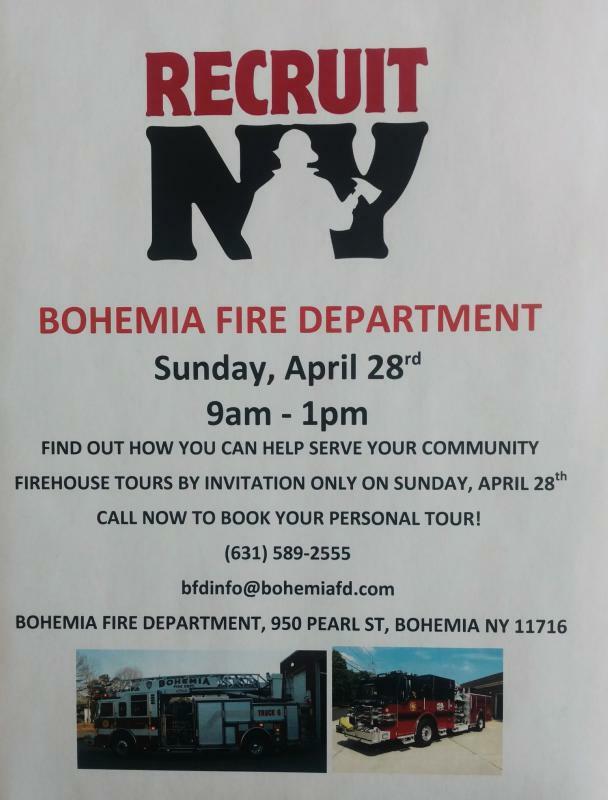 On Sunday, April 28 as part of the Recruit NY campaign, the Bohemia Fire Department will have tours available at headquarters for those people interested in finding out what it entails to be a volunteer firefighter or fire police. We are looking for men and women from ages 18 and up. Learn about what services we provide for Bohemia, the tools and gear we use, our trucks and engines as well as benefits for members. All personal tours must be scheduled in advance so please contact us at (631) 589-2555 or email bfdinfo@bohemiafd.com to schedule yours today!